The Coptic Orthodox Church has condemned the targeting of Iraqi Christians in the militant-held city of Mosul, which caused the displacement of thousands into the autonomous region of Iraqi Kurdistan. The Islamic State (IS), formerly known as the Islamic State of Iraq and the Levant (ISIS), moved into Mosul last month, causing many residents to flee. Christians living in the city were given an ultimatum to convert to Islam, pay a religious levy or face death, reported Reuters news agency. Saturday was the deadline for Christians who were not willing to pay the issued taxes to leave the newly established “Caliphate”. The Islamist insurgent group is abiding by an ancient historic practice of paying taxes, where non-Muslims are to pay jizya to live in Muslim countries. The Christian community has been present in large numbers in Mosul since the earliest days of Christianity. The head of Iraq’s largest church told Reuters that the current situation is “worse than the practices of the Mongols in the medieval times”. 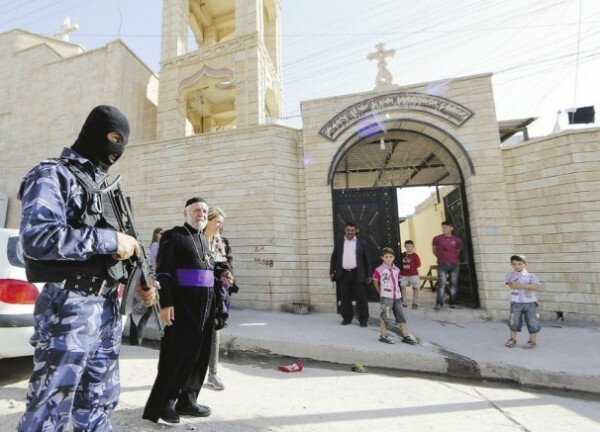 Iraq’s Prime Minister Nouri al-Maliki condemned Sunday the “extremist” actions by the Islamic State, which targets thousands of Christians in territories it controls, arguing that such practices might endanger the “centuries-old heritage” of the Christian community. Al-Maliki added that the Islamist group is targeting Christians, along with their properties and their houses of worship, which proves the group’s extremist tendency and “terrorist nature”. Plus, such practices reveal that the group is not pursuing any revolutionary agenda, said Al-Maliki. UN Secretary General Ban Ki-moon condemned Sunday “the systematic persecution of minority populations in Iraq by Islamic State (IS) and associated armed groups”. A statement published by the UN Sunday, asserted that “a number of minority communities that have lived together for thousands of years in Mosul and the Ninewa province have come under direct attack and persecution by IS”. “Tens of thousands of members of these ethnic and religious minority groups have been displaced or forced to flee and seek refuge, while many others have been executed and kidnapped,” said the statement. Ban stressed that the persecution of Christians in Iraq and their forced immigration from their homes could constitute a crime against humanity. Since the beginning of the year, almost 1.2 million people have been displaced in Iraq amid the ongoing confrontation between government forces and Sunni Islamist militants, according to the United Nations Assistance Mission for Iraq report on internally displaced persons in the country. From June 1 to July 16, the report estimates that around 100,000 people have been displaced in Ninawa, the governorate which includes Mosul. Sectarian killing increased in Iraq after the US-led invasion in 2003, and has been booming since the insurrection by the IS. Amnesty International said in a statement published on 14 July that besides abductions and displacement in every town and village that has fallen under IS control, others were subjected to deadly violence. Shi’a citizens and policemen were primary target for IS militants especially in territories left unprotected since the withdrawal of the Iraqi army from the area on 10 June, said Amnesty International.